1. Aim to arrive 5 minutes early to allow for your consultation and to use the bathroom if you need to. 2. 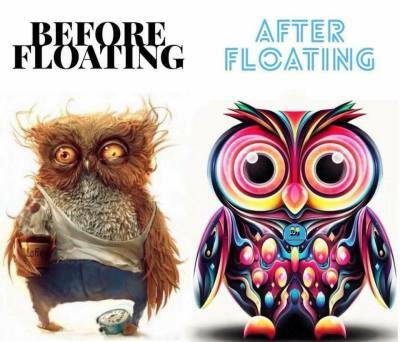 We will give you an introduction to floating. We recommend that you put your phone on silent or do not disturb mode so that it will not interrupt your float. 3. Have a shower. You want to remove natural oils, moisturisers, deodorants and dead skin to allow for maximum absorption of the Magnesium and Sulphate from the water while you float (pod is filled in 600kg of Magnesium Sulphate aka Epsom Salt). 4. Put in your ear plugs (we provide them for you). 5. Get into the pod and close the lid if you choose to (the lid can be left fully or partially open, or fully closed). 6. Lay back and float! The light switch is inside the pod so it is completely up to you if you float in complete darkness or not. The water will feel silky smooth to touch and your skin won't go wrinkly from being in the water for an extended period of time. 7. Music will play for the first 10 minutes of your float and will come back on for the last 5 minutes to signal that your float session is almost over. 8. Once the music stops, sit up slowly, open the lid and slowly step out of the pod. 9. Have another shower, get dressed and when you come back out to the relaxation room we will have a pot of herbal tea and filtered water ready for you! 2. We will give you an introduction to using an infrared sauna. Infrared saunas don't get as hot as traditional saunas. This is because rather than heat the air, like a traditional sauna, an infrared sauna heats your body using radiant heat. This means the air temperature is much more comfortable, but you still sweat! 3. Remove any moisturiser or make up using the natural witch hazel provided. 4. Undress and step into your private sauna. 5. We have herbal tea inside the sauna to keep you hydrated during your session and meditative colouring books to keep you entertained. 6. It can take up to 15 minutes before you start to sweat. The more hydrated you are the quicker you will sweat. 7. After your session is over you will hear a long beep. Slowly step out of the sauna and have a cold shower. There is only cold water to the shower! It is really important to have a cold shower after a hot sauna. Not only does the cold constrict your blood vessels quickly - making the more elastic, but it also helps your body cool down and bring all the blood from the surface of your skin back to your core. 8. Avoid putting any products on your skin after your sauna session. Heat can make your skin a little more sensitive. 9. Keep really well hydrated over the rest of the day!